Having survived the turbulence of Cambodia’s history, Master Kong Nay has become one of few remaining heirs to the tradition of chapey musical performance, handing on this legacy to a new generation. Through his performance and composition, he has spread awareness, throughout the world, the charm and versatility of this music, and has also contributed greatly to the training of young musicians, and to the UN’s human rights activities and the events to support disabled people. For the activities he has undertaken through his music both at home and abroad, he is truly worthy of the Arts and Culture Prize of the Fukuoka Prize. Master Kong Nay is a legendary Cambodian bard who miraculously survived the civil war and Pol Pot's reign of terror, and even now remains active as a performer and composer. While playing a long-necked, stringed instrument called chapey dang veng, he recites the Cambodian epic, Reamker, which is based on the ancient Indian epic, Ramayana, and also creates richly expressive songs about diverse themes including everyday life, people's feelings, moral maxims and social satire. In 2016, this music was registered in UNESCO's 'List of Intangible Heritage in Need of Urgent Safeguarding', and has been recognized as a profound cultural force whose power is felt not only by Cambodians but also by people all over the world. Master Kong Nay is the precious heir to this legacy. Currently he operates both at home and abroad: he has performed in the U.K., Australia and New Zealand (WOMAD, 2007－08), Japan (World Chamber Music 'Kong Nay', 2009, and 'Disability & Arts', 2015) and the U.S. (Season of Cambodia (SOC) Festival, 2013). 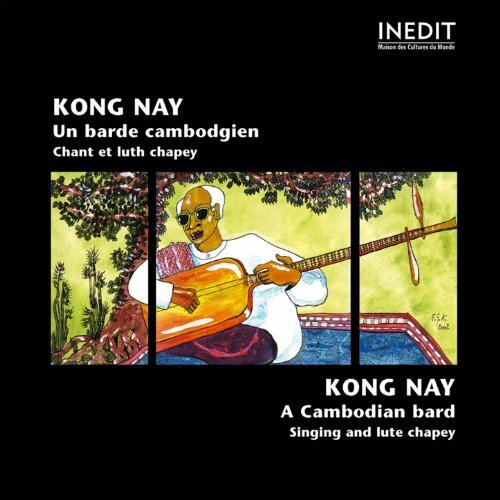 CDs such as A Cambodian Bard (2006), Mekong Delta Blues (2007) and The Rough Guide to Psychedelic Cambodia (2014) have disseminated the charm of his chapey playing and singings across a wide audience. On World Human Rights Day in 2010, he sang a new song for women's rights, Woman. Master Kong Ney was born in 1944 in a small village in Kampot Province (southern Cambodia). He lost his eyesight at the age of four due to smallpox. When he was 13 years old, he began to learn how to play the chapey under his uncle's tuition, which led him to become a musician. He miraculously survived the genocidal slaughter of the Pol Pot era in the late 1970s, and despite the continuing civil war afterwards, he resumed performance. He won first prize in a chapey competition in 1982, and then in a regional competition in his native Kampot Province, and also in another competition in Phnom Penh (1991). Between 1991 and 2007, he performed his music as a civil servant at the Ministry of Culture and Fine Arts, working for peace building and cultural reconstruction in Cambodia. In 2001, he was designated 'Master of Chapey' (the equivalent of a Japanese Living National Treasure) by the Ministry of Culture and Arts, and trained future chapey players through programmes such as those supported by an NGO, the Cambodian Living Arts (CLA)(2003－12). There are similarities to chapey performance in Japanese traditional moso-biwa ('blind priest biwa', biwa meaning Japanese lute) and Heike-biwa (the chanting of Heike Monogatari [The Tale of the Heike] accompanied by the biwa), but in terms of melody and lyrics, chapey music is more improvised. In order to keep the audience attracted, the musician introduces extemporized variations into the lyrics and music. Such impromptu creativity requires extensive knowledge and verbal facility, and virtuoso musical talent and technique. Recent activities by Master Kong Nay include joint performances with rock music (at an event for the World Human Rights Day, 2010, Phnom Penh), with jazz (Season of Cambodia (SOC) Festival) and with an orchestra ('Disability & Arts' at Tokyo University of Arts). The flexibility which enables him to create exciting music in these different genres is a byproduct of the improvising skills which were themselves cultivated within the traditional repertoire. Master Kong Nay, a survivor of Cambodia's turbulent history, has played a pivotal role in handing on the priceless treasure of chapey music to the modern world, and has actively engaged, on a global scale, in a variety of activities including performance, composition, training the next generation, and cooperating in the UN's human rights programmes and in events to support disabled people. For such great contributions, Master Kong Nay is very worthy of the Arts and Culture Prize of the Fukuoka Prize. Public lecture will be held at IMS Hall by inviting Master. KONG Nay,laureate of the Art and Culture Prize. Admission is free. We hope you will join us there.